Mokuren Dojo: How is the forward roll structured? How is the forward roll structured? Lead shoulder - if your body first hits the ground on your shoulder (sometimes you overturn and hit on your lats instead), then you want to make sure that you contact on the back of the shoulder, not on the top or point of the shoulder, as this is more easily broken. The best way that I know to insure that you strike the mat on the back of the lead shoulder is to pronate, or rotate the entire lead arm inward and palm-downward as far as it will go. This rotates the deltoid muscles of the shoulder over the point of the shoulder and locks the shoulder in a relatively stable position. Head and neck - as you contact the ground, you will need to clear your head out of the way. The best way to do this is to look away and tuck your chin, as if trying to stick your nose into your rear armpit. With the lead shoulder turned as detailed above, and the head tucked into the read armpit, your upper corner becomes very round. Abdominal control - as you roll across your back, you want to follow a path from the back of the lead shoulder diagonally across the back, passing the spine between the meatiest parts of the lats, to the side of the rear hip. It takes fine coordination of muscular action in your abs and back, as well as slikked placement of your legs as counterbalances to make yourself follow this path every time. Landing position - As I mentioned in a comment in the previous post, there is difference of opinion on this point, but I teach the classical judo landing position with the upper leg bent with the knee pointing upward and the foot behind the lower leg. The lower leg is mostly straight-ish and you end on the meaty, muscular part of your outer thigh and calf. There are more specifics to this landing position, but the important point is to land with the upper leg behind the lower leg - not crossed over in front. So, if you get those four points of structure in place, the rest of the roll before and between and after can be relaxed and pliable and soft and you won't go too far astray. I want to make a little film in the next few days of a kneeling forward roll, because it's the best way to explain some of the little details of the abdominal control thing I'm talking about here. Stay tuned! What's with the floating throws? Where is the initial kuzushi for shomenate? 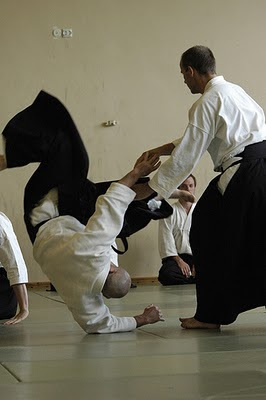 Should I do aikido for self-defense?